This morning’s rail replacement bus crash is being investigated by police after reports it hit another bus before crashing into a tree, ripping part of its roof off. 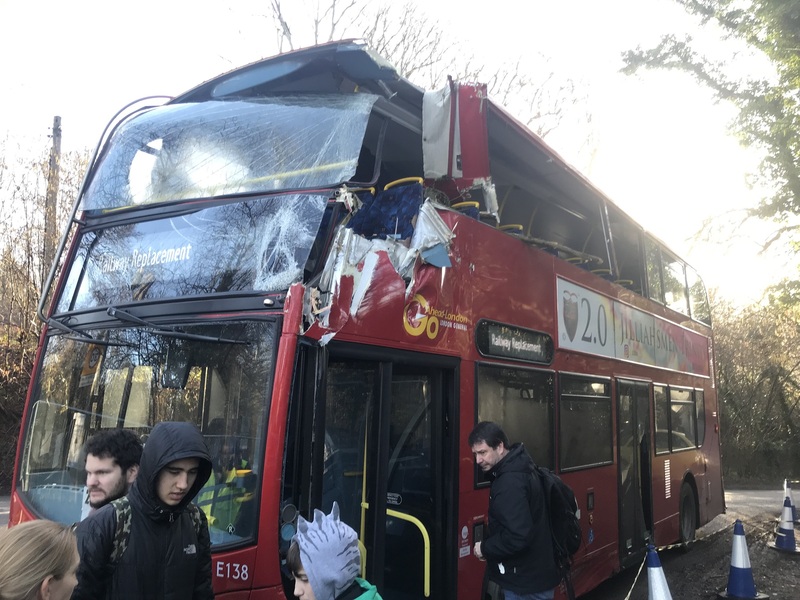 A witness appeal has been launched following the accident, which happened in Balcombe at about 8.30am as the bus took Brighton commuters to Three Bridges. Two women passengers, aged 61 and 27, received minor injuries and were treated by paramedics. A police spokesman said: “The incident was reported to police just after 9am and occurred on the B2036 close to the junctions with Newlands and Bramble Mead. “Two women, aged 61 and 27, who were passengers on the bus, were treated by ambulance paramedics. The elder woman was taken to the East Surrey Hospital for treatment to a minor knee injury. “Police are investigating a report that the bus was in a minor collision with another bus before hitting the tree, but have not identified that vehicle, which did not stop at the scene. The rail replacement buses are on service all this week during the nine-day closure of the Brighton mainline from the south coast to Three Bridges while Network Rail upgrade the track.